The World Series is always an exciting time of the year for any baseball fan, no matter who you’re rooting for. With both teams having fought all season long, neither wants to give an inch in their quest for the title, and players from both sides usually step up in a big way for their respective teams. With that said, I’m not sure anyone could’ve predicted such a game as the one that took place on Tuesday night. Matt Harvey received the start for the Mets, going up against the Royals’ Edison Volquez. Although you had to figure Harvey would be on top of his game, things didn’t start off that well for him. On the very first pitch of the game, Alcides Escobar drove a ball deep into the outfield, which Yoenis Cespedes was unsuccessful in tracking down. When all was said and done, Escobar had score with the twelfth inside the park homer in World Series history, and the first since 1929. 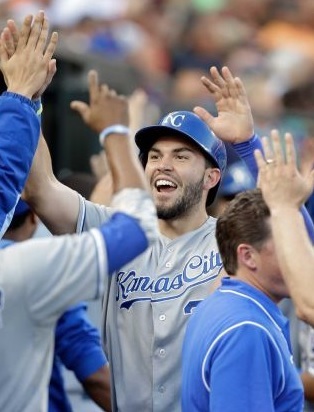 Just like that, it was 1-0, Royals. Neither team would score again until the fourth inning, as Volquez was able to match Harvey pitch for pitch to begin the game. But an RBI-single in the fourth by Travis d’Arnaud, followed by a Curtis Granderson homer in the fifth and a sacrifice fly by Michael Conforto in the sixth, made it a 3-1 Mets lead. It appeared they were starting to put the game away, especially with Harvey on the hill. 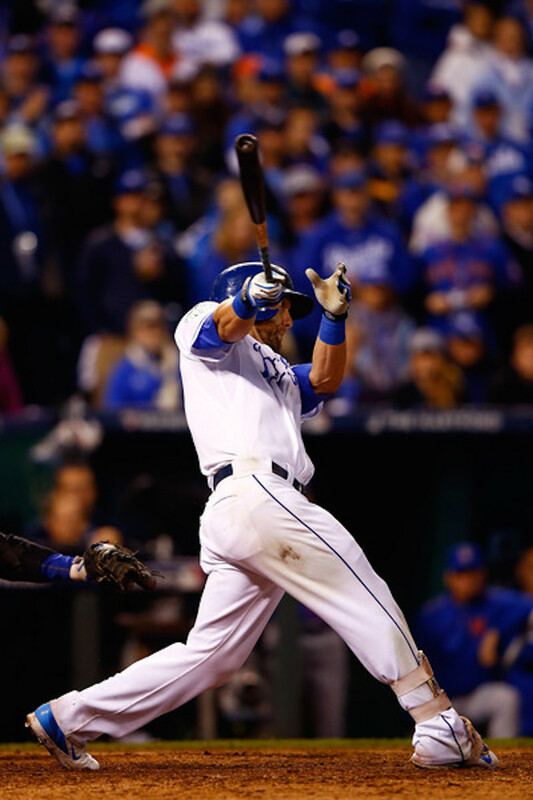 But just as quickly as they took the two-run lead, they lost it in the very next set of swings for the Royals. In the bottom of the sixth, a couple of timely hits tied the game up at three apiece and made it a new ballgame. Even so, the Mets were able to take the late lead in the eighth on a fielding error, putting them up by a run heading into the bottom of the ninth. However, as history has shown, nothing is over until it’s over in the World Series. With one out in the bottom of the ninth against the Mets’ Jeurys Familia, Alex Gordon blasted a solo shot into deep center field to send the game to extra innings. Due to outstanding relief work by both squads, the game would remain tied all the way until the fourteenth inning, when the Royals ultimately won with an Eric Hosmer sac fly that brought home the go ahead run to put the Royals up 1-0 in the seven game series. After the longest game one in World Series history, you got the feeling that the entire Fall Classic would turn out to be much of the same. The five hour and nine minute game one gave fans tons of excitement, as the back and forth lead changing between the two clubs made for a thrilling ballgame. With Jacob deGrom set to go against Johnny Cueto the very next game, things were sure to heat up in game two. But while the expectation was a pitching duel for the second game of the World Series, it was Johnny Cueto stealing the show. With deGrom not being able to throw the ball past people the way he has in his previous starts, he struggled in this game overall, but Cueto settled in and really impressed a lot of people. Although Cueto allowed the game’s first run in the fourth inning, coming from a contribution from Lucas Duda — he had been performing poorly throughout the playoffs until that point — Cueto really pitched well. Cueto wouldn’t allow another run in the game. 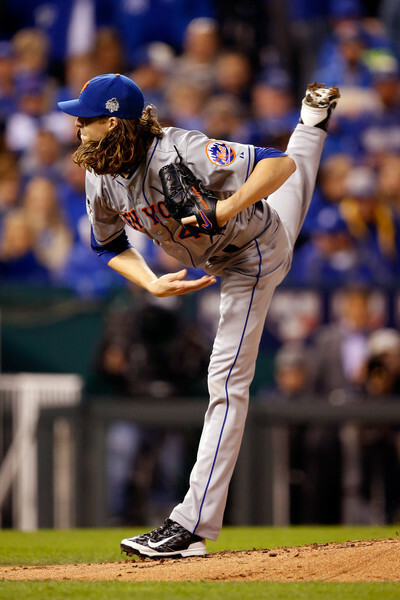 Jacob deGrom looked decent to start the game, but the wheels completely fell off in the fifth inning. RBI-singles from Alcides Escobar, Eric Hosmer (two RBI’s) and Mike Moustakas put the Royals up 4-1, and really gave them momentum with Cueto pitching the way he was (a complete game two-hitter). In the end, the Mets couldn’t mount a comeback and fell down two games to none in the series. With the Royals up two games heading into game three in New York City on Friday, the Mets certainly have their backs against the wall. However, despite their poor odds, with Noah Syndergaard ready to pitch in game three and Steven Matz on the mound the next night, if the Mets can win at least one of those games, everything changes. Forcing at least a game five, the Mets would once again get Matt Harvey, then Jacob deGrom if they can extend it. Anything can happen after that. This World Series is far from over. Going against preseason predictions and beating all the odds just to make it into the postseason, the Royals and Giants seemingly breezed their way through their given division series and championship series rounds on their way to the World Series. So evenly matched, as teams with a great pitching staff, lineup and bullpen, you had to figure that this year’s Fall Classic was going to be a great one. And, as I predicted, it surely has been exciting so far. 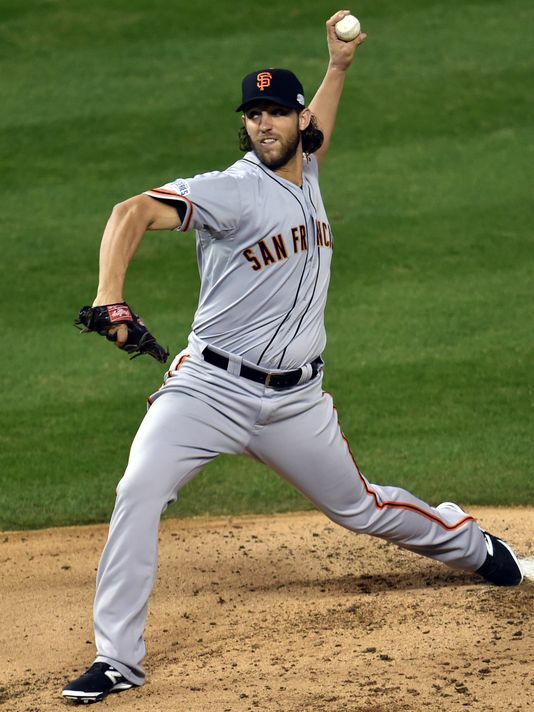 In game one on Tuesday night in Kansas City, Madison Bumgarner of the Giants took on the Royals and their best pitcher James Shields. For the Royals’ fan base, this game was something that they haven’t been able to experience in a long time, with the Royals last having made the postseason in 1985. But unfortunately for them, things didn’t start off too well, with three runs being scored in the very first inning by the Giants, off a Pablo Sandoval RBI-double and a Hunter Pence two-run home run. 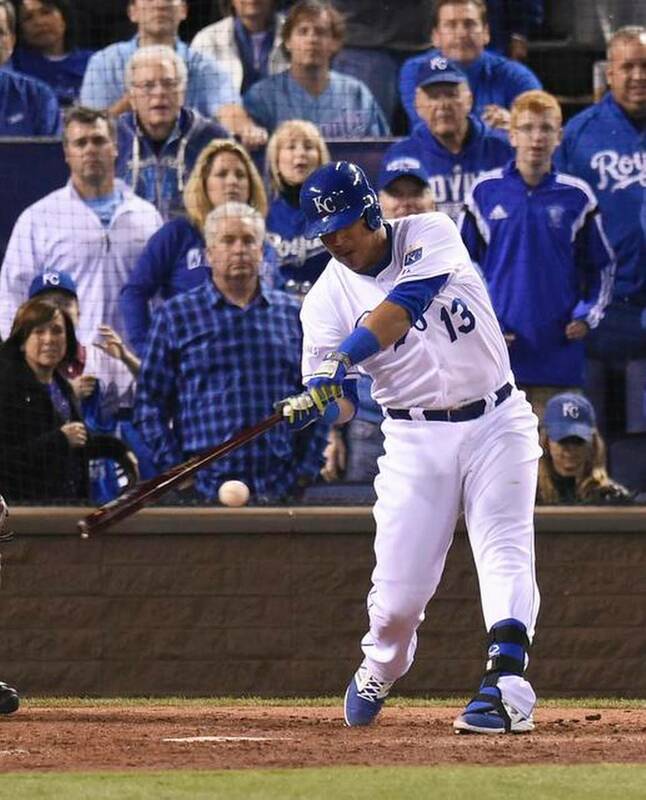 From there, things simply got worse for the Royals. The Giants scored yet again in the fourth and the seventh, plating a couple of runs each inning, to take the score up to 7-0. With Madison Bumgarner on the mound, the Royals faced an impossible climb to reclaim the game, as despite a solo home run from Salvador Perez in the seventh, that would be the only run Bumgarner allowed, giving up just a total of three hits. With the Giants taking the decisive 7-1 game one victory, you began to wonder whether or not this was going to be as competitive of a World Series as it had been advertised to be. But all thoughts of that were erased in game two, as things were much more thrilling for the better part of the game. However, things didn’t start off looking too good for the Royals once again. The first batter of the game, Gregor Blanco, blasted a solo home run off the Royals’ flamethrowing Yordano Ventura, who became the first rookie to start a World Series game for the Royals in their history. From there, though, the Royals answered back, scoring a run in both the first and second innings off of the Giants’ Jake Peavy. The Giants would tie the game in the top of the fourth inning, before the wheels came off in the sixth. Jake Peavy, who had been fairly good through this point in the game, was lifted after allowing the first two batters of the inning to reach base. His replacement, Jean Machi, allowed an RBI-single before being lifted for Javier Lopez, who recorded one out before he was replaced by Hunter Strickland. That would turn out to be a big mistake. Strickland, who hasn’t done much of anything in the postseason for the Giants, gave up a two-run double to Salvador Perez, followed by a two-run homer by Omar Infante — the fifth home run Strickland has allowed this postseason, tying the postseason record. Jeremy Affeldt would come on following Strickland’s removal, finishing out the inning without any more runs, but over the course of the 32 minute inning, the damage had been done. 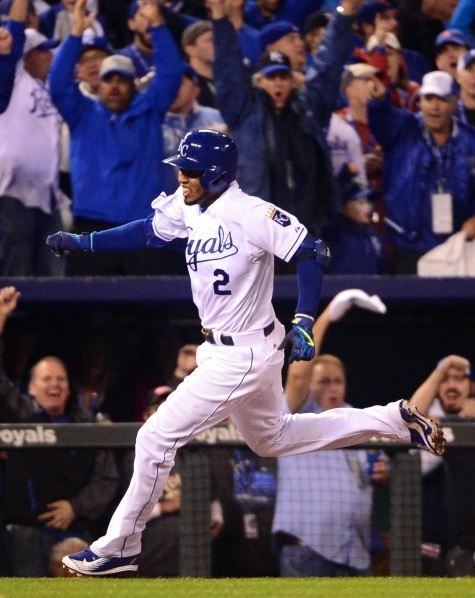 The Royals’ unbelievable bullpen subsequently shut down the game, securing them the 7-2 win. The Royals and Giants now head to San Francisco tied at a game apiece. If either team can sweep the three games, which begin on Friday, the 2014 World Series Champion can potentially be crowned at AT&T park. But although baseball is unpredictable, it’s likely that the series will head back to Kansas City for game six and (possibly) seven in the final days of October.